When a specialist consultancy in resource efficiency need someone to supply and install a controlled contamination room – they contact cold room solution specialists MTCSS. 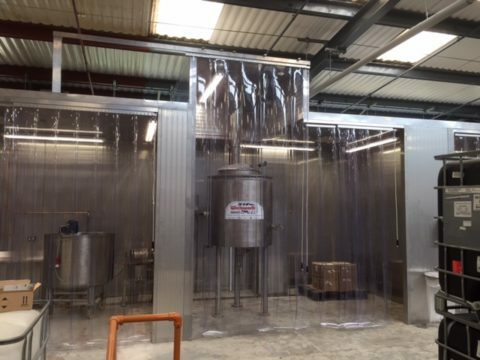 Our customer required a solution to suit an environment with high risk processes for a manufacturer of food flavourings and extracts. They required two triple compartment clean rooms, with forklift access and sliding curtains in a high risk environment. As part of the brief, MTCSS needed a solution to fit a 40kg mixer motor to the wall whilst adhering to the health and safety standards of a controlled environment. Not only that – but we were also tasked with building a compartment to allow forklift access to a chemical tank at a height of 4 metres. Alongside these challenges, we were required to complete the project from site survey to project completion and hand over in just 4 weeks. 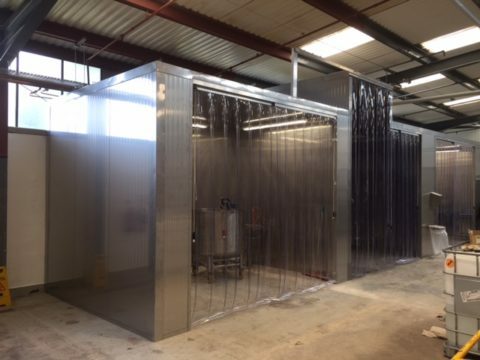 Clean rooms require a controlled level of contamination and low level of environmental pollutants, such as dust and airborne microbes, so MTCSS’ build needed to adhere to all regulations. 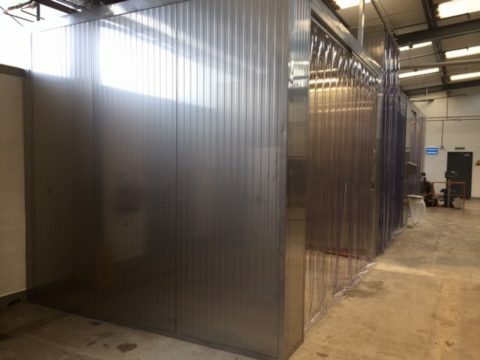 The team built the non-temperature controlled triple compartment rooms with stainless steel panels – using stainless steel instead of the standard white food safe laminate to avoid stains from the chemicals used in production. The Kingspan panels used were also all 30 minute fire rated. 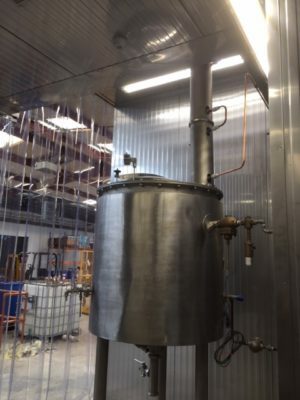 The customer required one of the compartments to have forklift access to move chemicals at a height of 4 metres – MTCSS’ solution was to build a higher section in the structure to allow the tank to fit underneath, with space above the tank for the forklift to gain access (image bottom right). The raised area was supported by the existing steel work of the building using top hat steel support and steel drop rods, creating the floating raised ceiling. 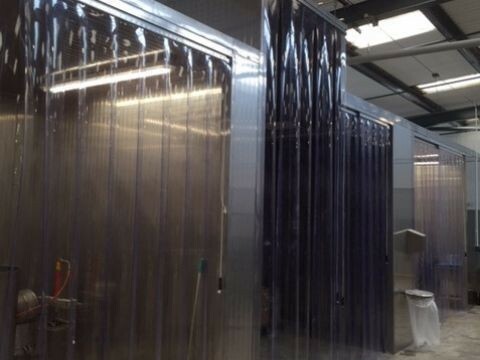 Sliding curtains were fitted making all compartments easily accessible and to accommodate forklifts. For the raised section a triple sliding curtain was needed for entry to both sections of the compartment. MTCSS worked closely with the client to achieve a solution to their needs – resulting in two triple compartment clean rooms, successfully delivered within the tight four week time schedule. If you would like to know more about how MTCSS can help and solve your cold storage problems – please call us on 01886 833381, email us at sales@mtcss.co.uk or fill in a contact form for a no obligation quote, or more information on the services we have to offer.